For a limited time, get ALL 5 exciting Supa Dupa Babee action figures in a full set for only $30! That is a savings of over 40%. The Supa Dupa Babee Family Set includes Supa Dupa Babee, Tippi Turtle, Giffy Giraffe, Baetsey Bear and Fawnee. Action figures minimum 8" tall. $30.00 .. Item AFSET ..
Let your children play along with Supa Dupa Babee! 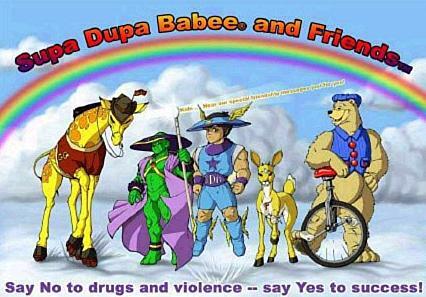 Now your children can "play along" with Supa Dupa Babee and friends to help rid the world of drugs and violence. These high-quality, durable action figures excite children's imaginations while teaching them Supa Dupa Babee's important lessons. To order call Business: (706)453-4355. Each action figure says three different phrases when you move its arm or leg. Batteries not needed! These quality action figures have been manufactured by Ricowell Limited. Stay tuned for more exciting products to come!